Houston's Patrick Ianni and Gamba Osaka's Bare battled for the ball in the first half of last night's final game of the Pan Pacific Championships at Aloha Stadium. Somebody might want to find a way to include Brazil in the 2009 Pan-Pacific Championships. Brazilian striker Bare scored a hat trick plus one of four goals as 2005 J-League champion Gamba Osaka dominated its Major League Soccer counterpart, the Houston Dynamo, 6-1 in the title match of the inaugural exhibition tournament at Aloha Stadium. Gamba players celebrated with the PPC trophy and were showered with confetti on the stadium field. Thanks to the sharpshooting Brazilian, Japan owns the Pacific region's best soccer team for at least one year. Fans who remember Pele's four-goal performance at the stadium in 1976 might have thought Bare was the second coming of the Brazilian soccer legend. A crowd announced at 23,087 -- surpassing that 1976 crowd of more than 21,000 as the largest gathering in Hawaii to see a soccer game -- saw Bare continue his dominant reign in the tournament by blasting two goals past the Dynamo defense in the first half and tack on two more after halftime, for a tournament total of five scores. He accounted for Gamba's lone score in its semifinal win over the Los Angeles Galaxy on Wednesday. Gamba coach Akira Nishino glowed about Bare's 20 goals during J-League play last year. "I feel that he should have scored three times as much," Nishino said through a translator. "He is a great offensive member." On the stadium's artificial FieldTurf, which several players from the four teams had commented on its foreign feel, Nishino said, "I hope we play on artificial turf more often." 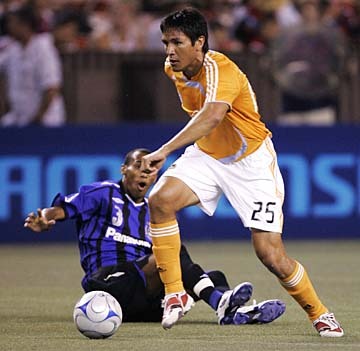 Haleiwa native and Dynamo forward Brian Ching didn't score a goal in the tournament. He left in the 88th minute to a rousing ovation and waved at the crowd. "We tip our hats to Gamba Osaka. It's not the way I wanted to end the week ... we got a little leggy tonight. (But) the fans of Hawaii were nothing but fantastic to me and my team. I always feel welcome here." 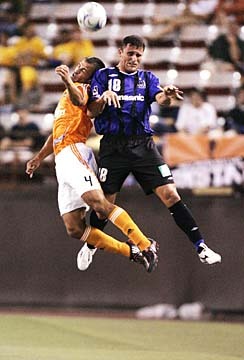 Houston's Brian Ching dribbled past Gamba Osaka's Mineiro during the Pan-Pacific Championship final. The Kamehameha grad was held scoreless. More than just the first PPC title was on the line. Pride was at stake between the respective 2007 champions of the J-League and MLS. In the end, though, Houston simply could not keep up with speedy Gamba, which was missing seven players away with the Japanese national team. The Dynamo were without forward Dwayne De Rosario, who scored in Houston's 3-0 win over Sydney FC in Wednesday's opening round. "We were reacting rather than acting," said Dynamo coach Dominic Kinnear, who was still good-natured after what he called "the most lopsided loss in the history of my life." Houston got on the board first with a brilliant diving header by midfielder Ricardo Clark on a cross in the 13th minute, but that would be all for the Dynamo. Bare, not to be outdone, threaded through three Dynamo defenders in the 14th minute and juked past goalkeeper Pat Onstad to knot things up at 1. He tacked on another score in the 26th minute on a blast from the left side of the Houston goal. After yielding the opening goal, the Gamba defense clamped down as well. Its technically proficient players, while not as tall, impeded all of Houston's further cross attempts and routinely exploded out for counterattacks headed up by forward Bare. He broke away from the pack in the 60th minute and gently prodded the ball over Onstad's outreached hands to complete the hat trick. Lucas, also of Brazil, tacked on another goal in the 64th minute and Masato Yamazaki put in the final score in the 78th. Meanwhile, it was a double dose of consolation for David Beckham and the Los Angeles Galaxy. Beckham and friends earned a little payback in the Pan-Pacific Championships third-place game with a 2-1 victory over Sydney FC, a Hyundai A-League (Australian) team that defeated the Galaxy 5-3 in an exhibition in November. Beckham sparked Los Angeles, of Major League Soccer, early with a booming, 40-yard lob pass for teammate Ely Allen, who snuck in by Sydney's right goalpost and kneed in the game's first score in the third minute. The popular midfielder from England was cheered every time he touched the ball. "It's always nice to have assists and it's a good night for us, good night for the team," Beckham said. As for the cheers, he added, "It's great. I'm honored that people enjoy watching me play and watching the team play." FC's Brendan Renaud evened things up in the 42nd minute when he found himself unguarded from about 30 yards out. His blast carried across the front of Galaxy goalkeeper Steve Cronin and into the opposite side of the net. Galaxy midfielder Josh Tudela's persistence was rewarded when Sydney keeper Ivan Necevski couldn't get a handle on a sharply kicked ball. Tudela got in on the deflection and booted the ball past in the final minute before halftime. Both teams had several opportunities to score in the second half, but the 2-1 halftime margin endured. "We played excellent football," Galaxy coach Ruud Gullit said. "Very happy with the way they executed the game. They played within triangles, they found each other easier." Galaxy all-star forward Landon Donovan missed both matches of the tournament with knee tendinitis. Sydney lost 3-0 to the Houston Dynamo of MLS in the opening round Wednesday, while Gamba Osaka edged the Galaxy 1-0 in their opener.